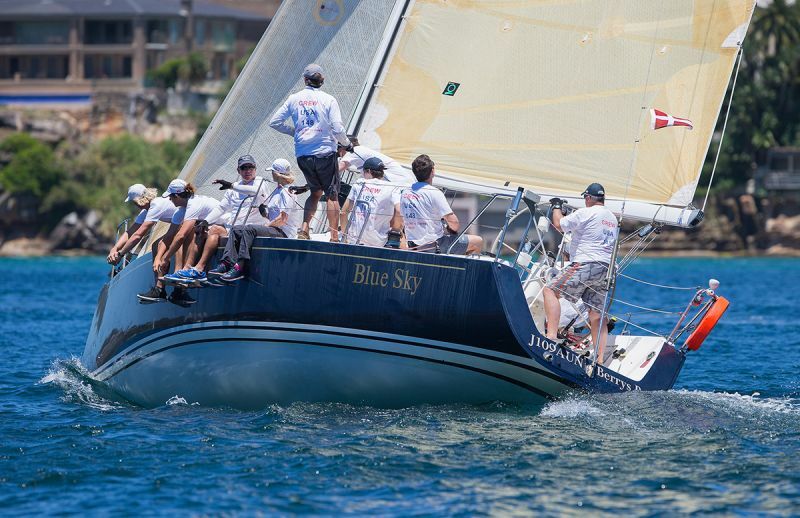 Those new to the Club may not be aware that once each year, on a Saturday in February, we "cruise in company" to Pittwater, then race from Barrenjoey to Taylors Point, before berthing at RMYC Newport for the night (with socialising, dinner, more socialising). Then on Sunday morning, we race from Taylors Point to Barrenjoey before a "cruise in company" back to Sydney. Prizes are awarded after the first race, and the overall winner of the two races has their name engraved on the perpetual, and very attractive, Don Deller Trophy. This year, the two "cruise in company" legs could not have been more different. Saturday gave us a very pleasant sou-easter for which most chose to set shy spinnakers or asymmetric spinnakers; the former had a one-tack passage in very warm conditions on a relatively calm sea. It appeared that Crooz, with aso, preferred not to cruise in company but instead to do some duty-free shopping in NZ (a booze Crooz? ), but we were pleased to see that they eventually turned for Barrenjoey. The dinner on Saturday was a great success with a much larger than expected attendance for what RMYC advertised as the "Blues Point Marina" dinner. Prizes were awarded for place-getters in Race 1, with the traditional paddle to the last-place getter (could be useful for stirring the gin and Aquatonic). Bacon, eggs and worried faces were seen around RMYC on Sunday morning as most skippers weighed up whether they would make the return journey that day given the forecast southerly and rising sea conditions. Well, all except Steel Sapphire, whose only concern was potential spillage of drinks on the return leg. After consulting many forecasts, Celete and Megisti Blue decided not to venture South that day. It was a wise decision. The relatively placid race down Pittwater on Sunday morning changed considerably once the 25 knots+ southerly hit as boats reached Barrenjoey. Those continuing the journey found they had to head some kilometres out to sea before they could make their first tack that would allow them to be well out from Bangalley Head. One Mo' Time had two reefs in the main and a yankee headsail which gives some idea of the conditions. Unfortunately, Blue Sky blew its headsail on the leg out from Barrenjoey, which also coincided with a non-working motor, so had to return to Pittwater for repairs. Once effected, she continued her journey to Sydney, finally tying up at her mooring at about 10pm - well done! Martela also suffered some sail damage on the return leg to Sydney but made it back safe but tired. As to the overall winner of the two races, and therefore the winner of the 2018 Don Deller ....congratulations to Blue Sky, sailed by Carl Braden and crew.